One key role (perhaps “the” key role) in making the Project successful is the participation of the Host Families. This critical and important factor means that Project Leadership in Arlington needs to complete selection and commitment of well matched Host Families as soon as possible. The Northern Irish teens will all be within a few months of 15 years of age (plus or minus 6 months), when teens leave Northern Ireland to come to Arlington, and none will be more than just over 16, when the summer ends. They generally have completed the U.S. equivalent of the ninth grade. Typically, teens from Northern Ireland are mature in terms of responsibility. They do not have as much choice about their lives as American teens. Although trying to ensure teen and Host Family matching to account for the same general age and grade level of the American host teen, any teen who is at least 14 years of age and having completed the eighth grade by June of the Project summer, will be considered as hosts. The host teens and their families must be ready to make a commitment to the Project from late June through late July, because the "bridge-building" effort will focus on the combined group for that month. The selection process requires a Project Leadership visit with both the prospective teens and parent(s). We will also need Host Families for the two Adult Counselors from Belfast. Host Families for the Counselors do not need to have a teen at home and the Counselors are at least 21 years old. Packet Who Needs This Packet? Teen and Host Family Application (PDF) American Teen who wants to do the project and the host family or parents of the teen who wants to do the project. Adult Living in Host Family Home (PDF) Anyone 18 years or older living in the host home with the American and NI teen during the project and not the parent of the American teen. (for example, siblings or relatives that are 18 or older that are living at home during the project). Separate from the Host and Teen Application Packet. Volunteer Form (PDF) Any adult volunteering their home, pool, residence or time to the Ulster Project. Family who will be hosting and driving a NI Counselor during the project. 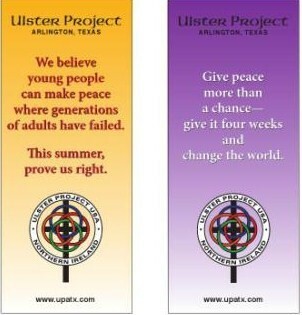 Northern Irish (NI) Counselor Form (PDF) NI Counselor coming to America to do the Ulster Project. **All persons 18 or older that reside in the host family home during the project are required to complete the Adult Volunteer form which includes a Background Check Authorization. **Don't forget, all adults participating in the 2011 Project must complete a Background Check authorization form each year you participate. Click HERE to download or print your PDF form for a Background Check and send it in. If you have a teen-ager, 14-16 years old (you cannot turn 17 before August 1st), you may qualify as a Hosting Family.